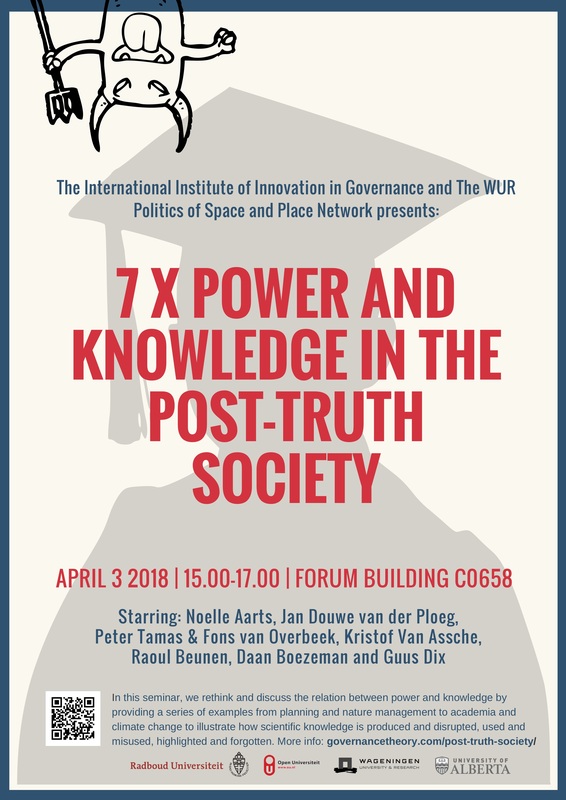 In this seminar, we rethink and discuss the relation between power and knowledge by providing a series of examples from planning, nature management to academia and climate change to illustrate how scientific knowledge is produced and disrupted, used and misused, and highlighted and forgotten. The return of several wildlife species across Europe has led to heated debates over how to deal with them. I will focus on the rhetorical work of gaining the upper hand in these debates. I use the classical theory of stasis as a systematic method for locating the points of contention within a debate and understanding participants’ rhetorical efforts at these points. Drawing on diverse discussion forums – including mass and social media, expert symposia and parliamentary meetings – results show how opposing groups engage in a continuous alternation between the construction of a suitable logic in support to their own viewpoint and the dismantling (and rhetorical disempowering) of the logic of the counterparty. We will then explore if and how the points of contention could serve as points of connection, especially by making the discursive power play explicit at the moments ambiguity is created, and contradictions can be transcended. Van Herzele, A., N. Aarts & J. Casaer (2015). Wildlife comeback in Flanders: tracing the fault lines and dynamics of public debate. European Journal for Wildlife Research, 61(4), 539-555. Van Herzele, A. & N. Aarts (forthcoming). Arguing along fault lines: a stasis analysis of public rhetoric over issues of wildlife comeback. The role of research and researchers in maintaining the viability of international development assistance has been well documented. Since the mid-1980s, such inquiry has often drawn on the work of Michel Foucault. Portions of the work of Foucault have also been taken up in and found useful for the production of knowledge in maintaining the viability of international development assistance. This paper reflects on ethnographic fieldwork whose purpose was to trace some of the working and consequences of the overlap of these two uses of Foucault. In its reflection on the production of knowledge on land tenure in peri-urban Bukavu, in the east of the Democratic Republic of Congo, the present essay finds evidence consistent with the impossibility of development knowledge and identifies some consequences of this impossibility for development researchers. The evolution of environmental governance is driven by a huge diversity of knowledges. Increasingly, however, the different understandings of the world create intensive conflicts and deceptions that not only hamper sustainability transitions, but also profoundly disrupt and weaken existing environmental policies and practices. I’ll argue that a more profound understanding of the way in which power/knowledge dynamics influence institutional change and exposing the growing discrepancies between expectations about particular institutions and their actual working and impact, are key to bringing governance systems on a more sustainable track. Beunen, R., Patterson, J., & Van Assche, K. (2017). Governing for resilience: the role of institutional work. Current Opinion in Environmental Sustainability, 28, 10-16. Beunen, R., Van Assche, K., & Duineveld, M. (2013). Performing failure in conservation policy: The implementation of European Union directives in the Netherlands. Land use policy, 31, 280-288.